Thanksgiving is just around the corner and we can’t wait to kick off the holiday season! Below are some local restaurants who will be serving up delicious Thanksgiving meals this holiday. Jinks Creek will be serving a traditional Southern Thanksgiving feast on Thanksgiving Day from 11 am to 6 pm. Reservations are recommended and can be made by calling 910-579-9997. For a sneak peek at their Thanksgiving menu, click here! Twin Lakes will be hosting their Cottage Style Thanksgiving meal from 11:30 am to 4:30 pm on Thanksgiving Day. While walk-ins are welcome, they highly recommend making a reservation. Guests can text their reservation to 919-612-2432 with their name, number in party, and preferred time. Their menu can be found here on their Facebook page. Boundary House will be offering up their annual Thanksgiving meal again this year. 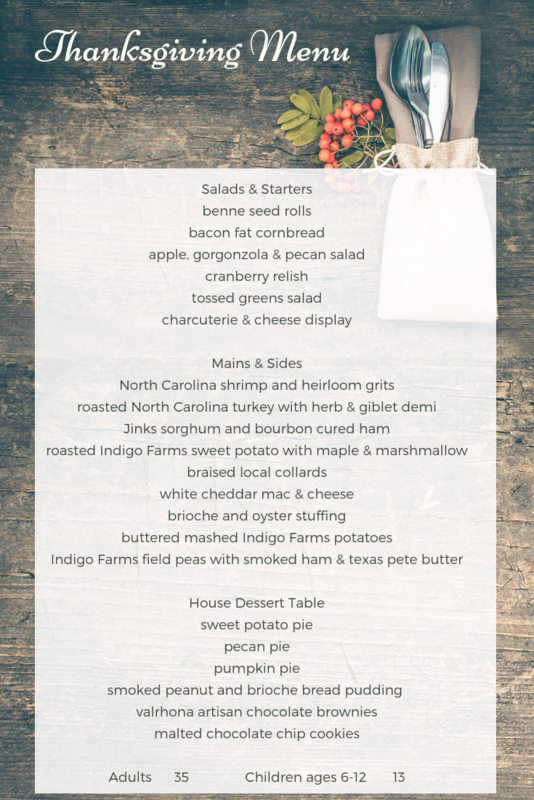 Feel free to call 910-579-8888 to make a reservation and click here for the Thanksgiving menu. Even though we all look forward to the Thanksgiving meal, there are many events to get us in the holiday spirit. Be sure to check out our list of all the upcoming happenings that we have approaching. Location: The flotilla begins in front of Inlet View Bar & Grill and ends at Sharky’s Restaurant in Ocean Isle Beach. The flotilla can be viewed anywhere between those two locations on the Intracoastal Waterway. Be sure to check back with us again soon for more upcoming holiday festivities. We hope that everyone has a wonderful Thanksgiving!